Growing up in the suburban Bay Area, I spent a fair amount of time traveling around in cars when I was young. I suppose it was a sign of things to come that I didn’t really enjoy being in the car even back then, and instead have fond memories of the walking and biking. From an early age, we walked to the public library, which was about 15 minutes away. Not only did it establish a pattern of walking for me, but naturally also a love of books and reading. Because of that experience, I always think of the library as a good possible walk destination. Here in Berkeley, I am just a 5 minute walk from one of the branches. Like many public libraries, Berkeley’s system is set up so that you can reserve books and other items from your home computer and have them sent to the branch of your choice. This is pretty convenient for someone like me, who checks out lots of books — I walk over to the library once or twice a week to pick up and drop off books. A couple of months ago, when I was picking up books, I noticed a sign posted on the door that the library would be closed for several weeks for renovations. I realized how much of a routine I had gotten into by my initial reaction of being upset at the closure. But then I decided that this was a great opportunity to experience the other library branches, which I have walked past on many of my walks. The Berkeley Public Library is composed of a main downtown branch and four neighborhood branches: South, North, West, and Claremont. They are pretty well spread out around town, so that many people are near one of the branches. Some households in the southwest corner of Berkeley are a bit of a walk from either the South or West branches, and the nearest branch for Berkeley hills residents is the North branch down the hill. Having a library within close walking distance seems pretty important to me, especially if you need to carry a large stack of books home, or if you check out large or heavy books. It’s also nice if you tend to check out movies on a regular basis, which need to be returned in a week. The libraries are all a bit different architecture-wise. The main branch is an Art Moderne building designed by Berkeley architect James Placheck. Also of interest architecturally are the North branch, a California Spanish style building (also by Placheck), and the Claremont branch, which is a Tudor style building. Each of the branch’s collections varies a bit, with the central library, of course, having the most materials and services. Of particular interest at the central library is the Berkeley History Room, which has all sorts of documents and materials for researching the history of the city. The West and South branches have collections of language (Spanish, Chinese, Japanese) materials, and the West also is the site of the library’s literacy program. The main library has a small Friends of the Library bookstore, and the branch libraries have small shelves of books for sale. But there is also a larger Friends bookstore hidden away near Telegraph Avenue in the Sather Gate center — definitely a place you would miss unless you were on foot or knew about it already. Next door to the South Branch is the very cool Tool Lending Library, which has free tools for check-out by Berkeley residents and property owners. This is an excellent resource for projects where you will need a tool that you would probably never use again in the future. Tools cost a fair amount of money, and take up space, so this is very handy for many residents. I am not sure if the concept of the tool lending library originated in Berkeley, but it looks like it may have been one of the first if not the original (started in 1979). 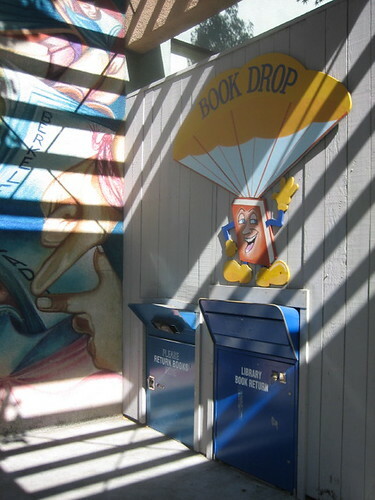 Other Bay Area tool lending libraries are offered by the Oakland Public Library (Temescal) and in San Francisco. Many of my walks for this project have been at times when the libraries aren’t open, so I haven’t always had the opportunity to stop in and browse the books for awhile. However, I plan to make a point of taking more walks in the future that include stops at the library when it is open. This week, I stopped into the North branch in the evening, which was a very pleasant experience. This branch is small but cozy, and it has a very community-oriented feel to it. Especially nice was a magazine exchange, where residents can drop off unwanted magazines from the past year; I picked up some copies of magazines that I like to read once in awhile. Stay tuned for another post about the other libraries in Berkeley beyond the public library! Several days ago I had an errand to do in Emeryville, so I did what I usually do when I need to go there: walk. I always enjoy the walk through southwest Berkeley to get there, but Emeryville is another story. If you are not familiar with this town, it is difficult and frustrating to be on foot – navigating the freeway and rail crossings, backtracking many times due to “no crossing on this side of the street” signs, dangerous intersections, etc. I had hoped to make some detours on the way home through Berkeley, but the trip to Emeryville had taken longer than I had anticipated. One of the places I had planned to check in on was The Shipyard, and – after hearing the news about this place the next day – I was sorry I had not stopped. The Shipyard is a collective art space located on the southern edge of Berkeley in a group of shipping containers. Well, I should say “may be” located. The Shipyard has been told by the City of Berkeley that it must move from the location. Scott Beale’s Laughing Squid blog has very thorough coverage of the news. If you have been following this blog for awhile, you can see that I have quite a few questions that I have been pondering as I walk in Berkeley. One that I have been thinking about from the very start of the walk is whether Berkeley is a supportive place for artists and a good place for those who appreciate the arts. This is a very difficult question to answer, and so far my best answer is “it depends.” It is also a difficult question to answer based only on what I see on walks. For a small city, Berkeley has a fair number of arts venues – the Berkeley Art Museum, art galleries, a few theaters, opportunities to see dance, music, poetry readings, etc. In the downtown area, I have seen signs referring to the growing Addison Arts District. 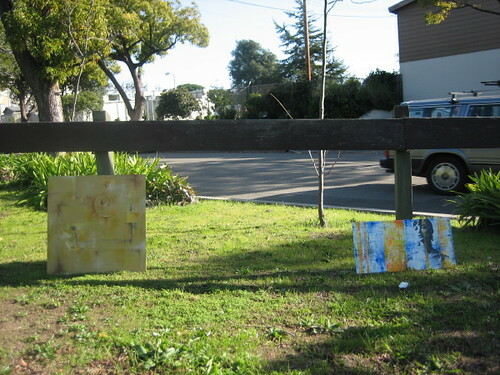 Rental studios for artists are available in West Berkeley, and artist open studios are held a couple of times a year. My sense in my travels around Berkeley is that there is support for the arts and artists, but that the city is somewhat lacking in a diversity of arts experiences and opportunities for artists. One reason for this is a very universal one in the arts community: many artists want or need to work in a place where it does not cost too much to have the appropriate space they need to work on their art. It is possible to find such a space in Berkeley, but not that easy — especially if a large space is needed. Artists who have lived in Berkeley for many years and have low housing costs or those who have a good income level or other source of income can easily have studios here. Artists with lower incomes and more experimental arts are not as prevalent here as in other places where the cost of living is comparably more affordable. Of course there are always exceptions – and I know artists who have found appropriate rentals in the neighboring suburbs of Albany and El Cerrito as well. After hearing about the Shipyard, I realized that what is not here in Berkeley has helped me pinpoint and better explain my sense of arts here. In Oakland (where the Shipyard may look for a new space), is a large industrial arts center called The Crucible. This organization offers arts events and classes in welding, blacksmithing, jewelry making, neon, fire arts, and a variety of other interesting disciplines. Originally the organization was located in West Berkeley but was not able to stay in the city. Before I moved to Berkeley, I went to a few events at an experimental music venue near Ashby BART that was called the Jazz House/Tuva Space. This space was closed and a Berkeley Police parking lot is in its place. Over the past few years, artists’ communities in West Berkeley (such as the Drayage) have closed due to lease or building code issues. Behind each of these arts venues, and the others like them, there is a complicated story to which there are always numerous points of view. And these events are certainly not unique to Berkeley; artists being in situations where they need to find new places to do their art is an age-old story. As I mentioned at the start of this entry, I can’t really say from my observations whether or not Berkeley is a supportive place for artists. What I can do is to observe the types of arts that do exist here and those that do not. I expect to talk more about art in Berkeley at some point, and would love any feedback from artists who live here or have lived here — and of course anyone else who has an opinion about this topic! Last year, Berkeley Public Library joined Link+, a union catalog of several California and Nevada libraries. Items may be borrowed from the participating libraries at no cost (as compared to most interlibrary loan systems, which charge a fee). I have been checking out all sorts of books that I have been wanting to look at but that are not available at the Berkeley library (most often books from academic presses or more suitable for college libraries). Recently, I checked out and read the double book Belltown Paradise/Making Their Own Plans. Both books look at community activism efforts, the first in the Belltown neighborhood of Seattle and the other in various communities around the world. Lots of interesting ideas in both books, but some of the most intriguing to me came from artist Buster Simpson. The projects section of Simpson’s website includes photos of many of the projects, including one of my favorites: tree guards fashioned from crutches and from bedframes. This book reminded me to keep looking, to look just a little harder at what is around me when I am out there walking. 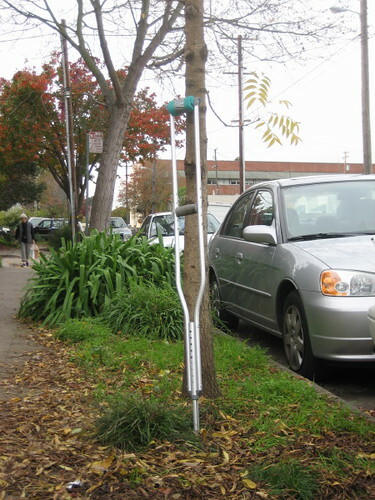 A few months ago I was drawn to this crutch leaning up against a tree by the curb. I liked the lines of the crutch next to the tree trunk, and I liked the idea that the crutch was there for someone else to use (being the kind of thing that many people only need for a couple of months while healing from an injury), but I did think of the possibilities of the crutch being used for the trees themselves. In any case, I definitely recommend the book to walkers, artists, and anyone interested in community garden and art projects. I have been meaning to talk about the Addison Street Poetry Walk for awhile, and now seems like an appropriate time with April’s National Poetry Month approaching. I do not want to go so far as to say that poets, compared to other writers, musicians, and artists, have it the hardest in terms of getting exposure for their work; one could make an argument for any specific group within this realm. (A New Yorker article from earlier this year, The Moneyed Muse, offers an interesting glimpse at some recent struggles in the poetry world.) However, I do imagine that there are many Americans who go for long periods of time without being exposed to much poetry beyond the greeting card stand. Not so in Berkeley; the city seems to have a higher than usual commitment to the promotion of poetry. The Poetry Walk is a series of 120 or so cast-iron plates set into the sidewalk along Addison Street in downtown Berkeley, each displaying poetry. The poems range from works form Ohlone Indian times to lyrics from the punk band Operation Ivy. A book on the poetry walk is available from local publisher Heydey Books. UC Berkeley hosts the free Lunch Poems series, and Robert Hass, former U.S. poet laureate, teaches in the English department. Poetry Flash, which includes poetry reviews and event listings, is published in Berkeley. But most relevant to my walk is the poetry I have found tacked up to fences, boards, and other places. Especially along the stairways and pathways, I have founded handwritten and typed poems tacked up for strollers to enjoy along the way. On Halloween last week I walked across town to a party during the time when all of the trick-or-treaters were out and about. I know there are lots of children in Berkeley, but I was surprised at the sheer number of children in neighborhoods (such as near the Berkeley campus) where I did not expect that many lived. On many of my walks I have taken note of all sorts of things that children can do here in Berkeley, but I have found this to be an area where it was challenging to stay neutral about the observations. As most people do, I have preconceived ideas (based on my childhood and my opinions as an adult) about what makes somewhere a good place to grow up. I am usually perplexed by and somewhat skeptical about the “best places to raise a family” lists published by various media outlets and polling organizations because they are often so subjective; everyone puts different weights on criteria ranging from quality of schools to crime level, housing affordability, and availability of services and opportunities specific to the needs of their children (such as health care for a particular condition or strong arts and sports programs). I can’t make too many comments about these factors on my walks anyway, but I can report on what I have seen for children around town. There are lots of parks and playgrounds throughout town with typical play equipment and structures. Virginia-McGee Totland has much more than the average in the way of toys and structures, and the Adventure Playground has a unique setup with hammers, lumber, paints, and opportunities for children to build and create. There are public swimming pools, and several parks have basketball and tennis courts, recreation centers, and fields for baseball, softball, and soccer. Tilden Park, in the Berkeley hills, has a merry-go-round, animal farm and nature area, a lake for swimming, a steam train, picnic areas, and hiking trails. Berkeley Iceland offers ice skating and hockey opportunities. In the way of culture and learning, there is a children’s museum, the Hall of Health, the Berkeley Art Museum, and other museums on the Berkeley campus. I am sure there will be even more to see as I continue to walk new streets. Two Berkeley women maintain a blog called Rookie Moms that has the goal of offering 365 activities for new parents. I have to admit that before I looked through it I wondered if it was just going to be a resource for parents who have lots of money to spend on themselves and their babies, but I was pleasantly surprised to find that this wasn’t entirely the case. Their Week in Berkeley section conveniently lists a variety of activities and notes the cost in cases where there is one. If you look at the blog entries tagged free/cheap and Berkeley, you’ll find all sorts of other interesting ideas, including library story times, nice places to walk with a stroller, “tiny tot” swimming lessons, and more. For those with money to spend, there are suggestions for baby- and child-friendly places to eat, classes, and services for parents. No, I have not forgotten about schools, but I will talk about that in a separate post in the future because there are quite a few points to cover there. I was wondering recently whether it would still be possible to learn about upcoming entertainment and events without Internet access. Most musicians and entertainers get the word out about their performances on event listing websites and email lists, their Myspace pages or personal websites, and on social networking sites. The simple paper notices, however, have not gone away. They are everywhere — fliers attached to poles, posters taped in business windows, postcards stacked in coffee shop corners. It seems perfectly possible to learn about concerts and shows without going online. I often stop to look at the fliers when I am out walking. The ones pictured here caught my eye because they represent two genres of music that have a history in Berkeley. It is interesting to look at the overlap of the notices and wonder if there was anyone who went to both of these events. 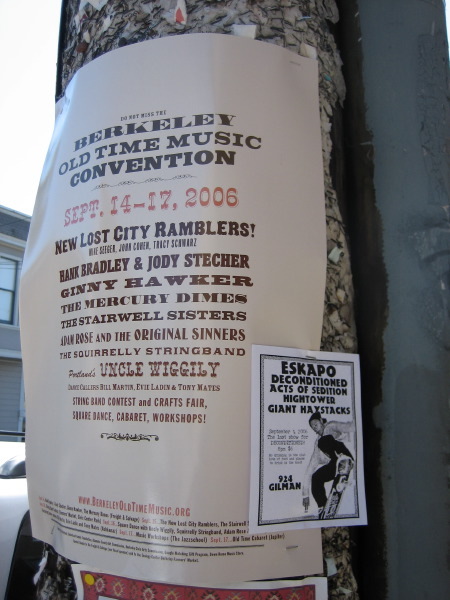 The Berkeley Old Time Music Convention has its roots in the Berkeley Old Time Fiddler’s Convention first held in 1968. The recent conventions have featured a string band contest, square dance, cabaret, and other events. 924 Gilman, the venue of the other event, is an all-ages (drug- and alcohol-free) club that has featured mostly punk rock acts. It started in the mid-1980s and is still hosting shows today at its West Berkeley location. Near 924 Gilman is a popular Mexican restaurant, Picante. Walking by in the early evening on a Saturday, you might see an interesting mix of people sitting at the tables out front — the many families and their young children stopping for a bite to eat after a day of shopping at nearby Fourth Street, along with the teenagers with mohawks grabbing some food before a show. In San Francisco, it would not be altogether strange to see a famous actor or musician while you were walking down the street. Plenty of films are shot on location in San Francisco, and the city attracts well-known musicians to its various concert venues. So far on my walks in Berkeley, I have not spotted any celebrities. When I walk by Fantasy Studios in West Berkeley, though, I often wonder if maybe I have seen someone famous and just did not recognize the person. 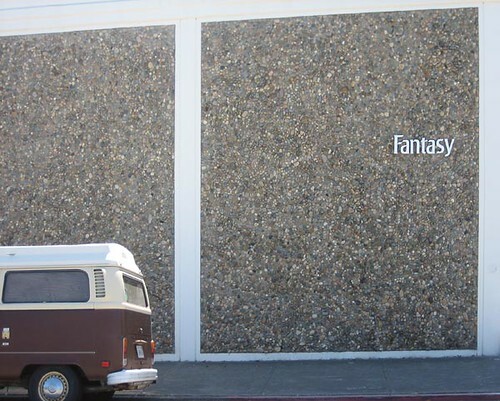 Fantasy was originally the in-house studio for Fantasy Records, and was then opened to the public. Artists such as Creedence Clearwater Revival and Santana have recorded at the studio. The record label is now based in Southern California, but the studio remains in Berkeley. I have often walked by and seen musicians coming and going, and wondered what it looked like inside. Thanks to the proliferation of video sites online now, I was able to locate a series of songs performed by Chris Isaak at Fantasy, and get a glimpse at the inside of the building. I had been aware of the music facilities at Fantasy, but what I did not know until recently was that it has also been the site of sound work for movies, including Amadeus, The Right Stuff, and The English Patient.